This scarf is a simple diagonal lace eyelet pattern that can easily be modified for use with any weight yarn and can be knit in any size by simply casting on more stitches or knitting more pattern repeats. The lace pattern is worked over a multiple of three stitches, so for a wider scarf cast on more stitches in a multiple of three or for a narrower scarf, take away a multiple of three. 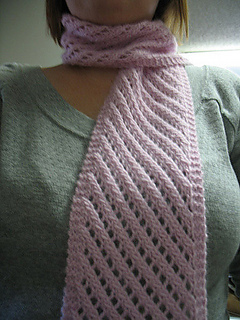 To make a longer scarf, simply knit the 6 row lace pattern as many more times as you would like. Keep in mind that the eyelet pattern stretches a considerable amount while blocking. A French translation of this pattern can be found here. Used to be available at Midnight Purls blog.